Caution: TMI for the male readers out there… or some of you! It may not bother you, but just wanna give a FYI!!!! Since my kids are pretty close together I’ve been pregnant or breast feeding since October of 2006! So all that to say I haven’t had many periods in there! I think I’ve had maybe7 or 8 max! It’s been quite nice, I must say! I also have an 12 month old and the ole crimson tide hasn’t yet returned! 😉 HALELUJAH! However, I really don’t have much to complain about. I typically only have about a 3-4 day medium flow cycle. After Tonchi, my first, was born someone introduced me to the [amazon_link id=”B000FAG6XA” target=”_blank” container=”” container_class=”” ]Diva cup[/amazon_link]. I’m a HUGE fan! I don’t usually have a lot of cramps so the monthly blah was only that… blah and messy, but not painful! I’ve refused to use tampons for years. Just the idea of putting chemicals, bleached cotton (or some other adsorbent material), perfumes and/or deodorizers next to a mucus membrane to soak for hours just doesn’t sound very healthy! 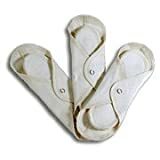 But the other option of pads just felt messy and uncomfortable and I felt like everyone else could smell an odor, although I hope that wasn’t true! 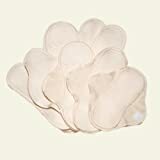 So now that I use the [amazon_link id=”B000FAG6XA” target=”_blank” container=”” container_class=”” ]Diva cup[/amazon_link] with some cotton menstrual pads, as backup, I’m comfy, clean, healthy and I hardly know it is that time of month! 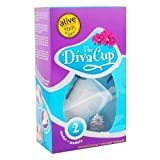 The [amazon_link id=”B000FAG6XA” target=”_blank” container=”” container_class=”” ]Diva cup[/amazon_link] is a silicone cup with a tab at the bottom for aiding with removal. I think it holds about ½ – ¾ oz of liquid at a time. The bottom is cone shaped so that it forms a seal and there is minimal leakage. I will say minimal… I can only count a handful of times that it has actually leaked. I even use it at night and it works great too! Usually on my first day of flow I do empty it once during the day, once before bed and not at all at night. There are other types of cups out there, but honestly I’ve never tried them. I’ve only used the [amazon_link id=”B000FAG6XA” target=”_blank” container=”” container_class=”” ]Diva[/amazon_link] since it works so well for me… there are two different sizes… pretty simple though Size 1 for pre-childbirth and Size 2 for post-childbirth! That easy! I also mentioned that I use cotton pads. Since I rarely overflow and I use the cup exclusively I really don’t need anything extra fancy or adsorbent. I had a ‘Mom’trepreneur’ make some for me! They are super simple with wings and snaps. Some of them are over night pads that have a pocket for extra padding, but I’ve never before tried it. They are a nice burgundy floral pattern and sorta fleecy so they are comfy to wear. I really like to purchase items like this from other mamas who try to make a few bucks while caring for their kids. I know what it is like to try and earn a few while caring for a family. It is a lot of work and commitment and I admire that! I know there are lots of Etsy shops that carry all kinds of varieties. Below are a few other options I’ve been told are really good as well even though I’ve never used them. 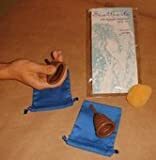 DiaperSwapper – A lot of WAHMs on this site for resources… might even be able to find a local one! There are a TON of other resources out there if you look! I’ve been in baby diaper mode since July 2007 and haven’t had a break yet. Currently we only have 1 in diapers, but there have been a few stretches of two in dipes at a time! We do cloth diapering so there is always a pail with a few diapers (or a lot) waiting to be washed. I just throw my pads in with it. If they were pretty soiled I would probably rinse first before washing. But in case you haven’t gotten the memo previously, my [amazon_link id=”B000FAG6XA” target=”_blank” container=”” container_class=”” ]Diva[/amazon_link] DOES NOT LEAK… so if I have a soiled pad it is only a spot or two… not worth rinsing. I wash pads, diapers and family cloth together. When we are through with diapers I plan to get a smaller pail and wash them by themselves. If you have a pad you love or another method for laundering I’ve love to hear!